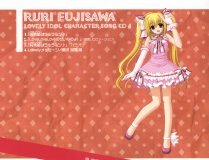 This CD single contains a character song by Sakai Kanako (charcter Fujisawa Ruri) for the TV anime Lovedol (らぶドル) [Lovely Idol]. 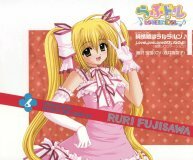 This CD includes a solo version of the ending song "Love Love Love no seinanoyo!" by Sakai Kanako. This is sung to the normal karaoke track, so the background vocals and voices are done by the other girls.